Back by popular demand, the Goffs UK August Sale made a successful return to the calendar today at Doncaster after a two-year absence and was headlined by Potensis Bloodstock’s dispersal. The Potensis draft was a huge drawcard for the sale and it didn’t disappoint with a number of major buyers and trainers in attendance and it produced the top lot of the day, the Grade 2 winning mare Jessber's Dream (Lot 235 - pictured), who sold to Tom Malone and the new syndication Ditcheat Thoroughbreds for £190,000. The draft was also responsible for the second highest lot of the day with the winning Hurdler Crin Au Vent (Lot 232) selling to Paul Nicholls for £120,000. 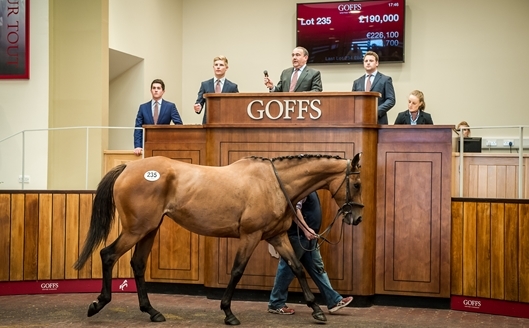 Godolphin, a fantastic supporter of all Goffs UK HIT Sales, saw their 19 strong draft headed by the three-year-old Long Call (Lot 129) who sold to Fleming Bloodstock for £60,000 while a host of Point-to-Pointers changed hands including Monbeg Stables’ Robin des Champs four-year-old Robin Deuz Pois (Lot 246) who was knocked down to Shark Bloodstock for £47,000. The sale opened with a session of over 80 Stores which was headed by Mill House Stud’s Presenting half-brother to the Grade 3 winner Ballabriggs (Lot 63) who sold to Ryan Mahon for £40,000. "The Doncaster August Sale was a key part of the DBS offering for many years and we are delighted with the reaction to its reintroduction after a two year absence. "We have always said that we will match any sales ring when we have the horses and the drafts from the likes of Potensis, Godolphin, Shadwell, HH The Aga Khan Studs and many others make the case quite graphically. There has been a real buzz from start to finish with a packed sales ring and palpable activity in the yards leading to a vibrant trade that will certainly ensure the August Sale is once again a permanent fixture in the Doncaster sales calendar. "We extend our sincere thanks to every vendor and purchaser and look forward to an equally enticing catalogue for our September HIT Sale. Before that though comes the Premier and Silver Yearling Sales for which we can hardly wait as our vendors have supported us with a superb selection of top class yearlings that would grace any catalogue."